There are several different ways to remove the rain from the windshields. Most aircraft use one or a combination of the following systems: windshield wipers, chemical rain repellent, pneumatic rain removal (jet blast), or windshields treated with a hydrophobic surface seal coating. Windshield wiper assembly/installation on a transport catgory aircraft. 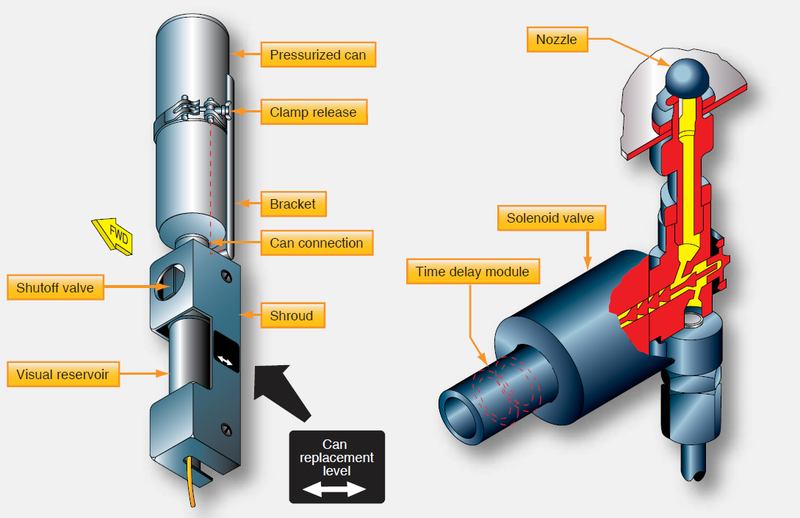 The motor-converter is mountd under the aircraft skin. Maintenance performed on windshield wiper systems consists of operational checks, adjustments, and troubleshooting. An operational check should be performed whenever a system component is replaced or whenever the system is suspected of not working properly. During the check, make sure that the windshield area covered by the wipers is free of foreign matter and is kept wet with water. 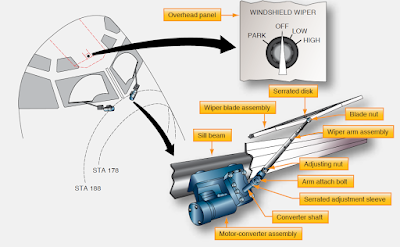 Adjustment of a windshield wiper system consists of adjusting the wiper blade tension, the angle at which the blade sweeps across the windshield, and proper parking of the wiper blades. Water poured onto clean glass spreads out evenly. Even when the glass is held at a steep angle or subjected to air velocity, the glass remains wetted by a thin film of water. However, when glass is treated with certain chemicals, a transparent film is formed that causes the water to behave very much like mercury on glass. The water draws up into beads that cover only a portion of the glass and the area between beads is dry. The water is readily removed from the glass. This principle lends itself quite naturally to removing rain from aircraft windshields. The high-velocity slipstream continually removes the water beads, leaving a large part of the window dry. This system should only be used in very wet conditions. The rain repellant system should not be operated on dry windows because heavy undiluted repellant restricts window visibility. Should the system be operated inadvertently, do not operate the windshield wipers or rain clearing system as this tends to increase smearing. Also, the rain repellant residues caused by application in dry weather or very light rain can cause staining or minor corrosion of the aircraft skin. To prevent this, any concentrated repellant or residue should be removed by a thorough fresh water rinse at the earliest opportunity. After application, the repellant film slowly deteriorates with continuing rain impingement. This makes periodic reapplication necessary. The length of time between applications depends upon rain intensity, the type of repellant used, and whether windshield wipers are used. Some aircraft models use a surface seal coating, also called hydrophobic coating that is on the outside of the pilot’s/ copilot’s windshield. [Figure 3] The word hydrophobic means to repel or not absorb water. 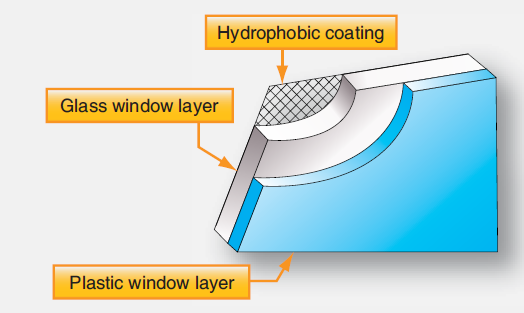 The windshield hydrophobic coating is on the external surface of the windows (windshields). The coatings cause raindrops to bead up and roll off, allowing the flight crew to see through the windshield with very little distortion. The hydrophobic windshield coating reduces the need for wipers and gives the flight crew better visibility during heavy rain. Most new aircraft windshields are treated with surface seal coating. The manufacturer’s coating process deeply penetrates the windshield surface providing hydrophobic action for quite some time. When effectiveness declines, products made to be applied in the field are used. These liquid treatments rubbed onto the surface of the windshield maintain the beading action of rain water. They must be applied periodically or as needed. 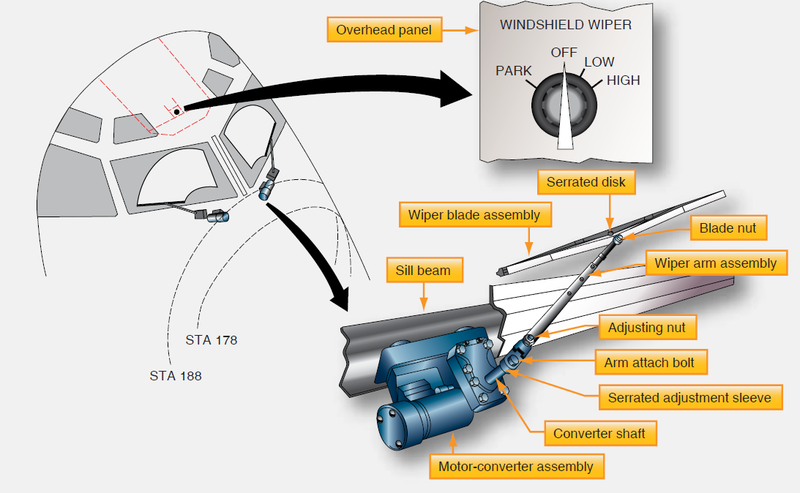 Windshield wipers characteristically have two basic problem areas. One is the tendency of the slipstream aerodynamic forces to reduce the wiper blade loading pressure on the window, causing ineffective wiping or streaking. The other is in achieving fast enough wiper oscillation to keep up with high rain impingement rates during heavy rain falls. 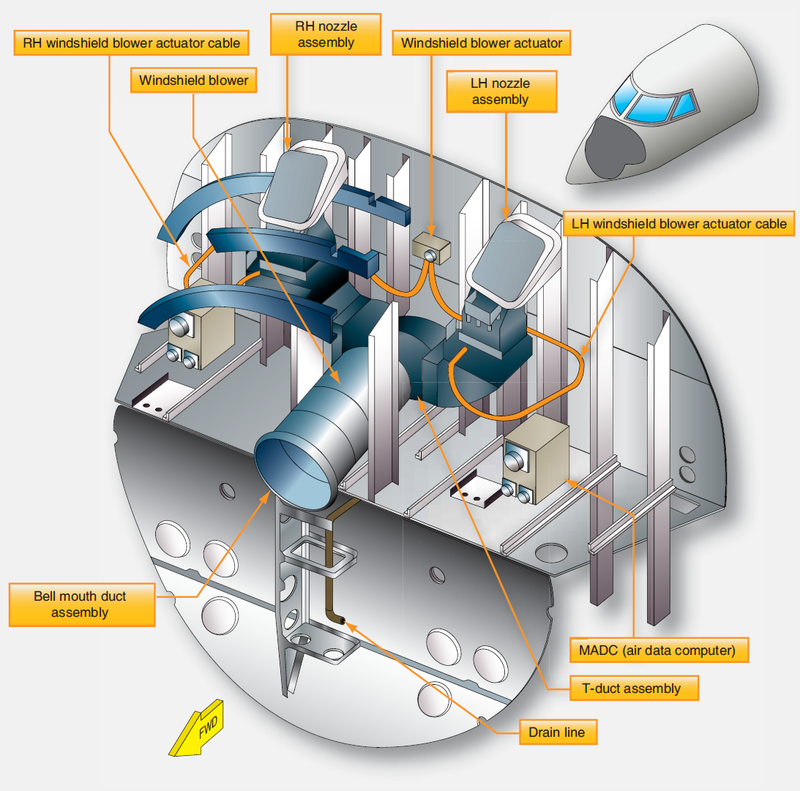 As a result, most aircraft wiper systems fail to provide satisfactory vision in heavy rain. The rain removal system shown in Figure 4 controls windshield icing and removes rain by directing a flow of heated air over the windshield. This heated air serves two purposes. First, the air breaks the rain drops into small particles that are then blown away. Secondly, the air heats the windshield to prevent the moisture from freezing. The air can be supplied by an electric blower or by bleed air.